Lowe Hill is a 12th century earthwork motte and baileys fortress, possibly founded by William de Warenne. The eroded motte, is partly encased by a ditch and the two north-eastern baileys lay in-line, dropping down the hill. Encasing the baileys, are traces of low banks and outer ditches but the earthworks have been mutilated by landscaping. A third in-line terrace, is just the result of levelling to accommodate a Victorian bandstand. A mile south-east is Sandal Castle and both castles are mentioned in a royal edict of 1324. Although there exact relationship is unknown, it seems likely they controlled the River Calder together. Lowe Hill, which was by tradition destroyed by a great wind, is now surrounded by trees and hedges, so is best viewed in winter. Lowe Hill is located in Wakefield, off Denby Dale Road. 10 miles south of Leeds on the A61-A636. 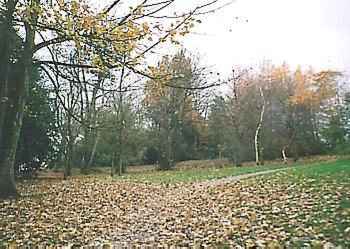 The site is in Thornes Park and is freely accessible in daylight hours.